Engineers are getting genes to do their dirty work, designing DNA that can build nanostructures for them. By getting DNA to do the heavy lifting, it is possible to create materials and devices on a mind-bogglingly small scale, which put the molecular properties of the materials to exciting new use. Scientists at the U.S. Department of Energy's (DOE) Brookhaven National Laboratory have used ropelike configurations of the DNA double helix to form a rigid geometrical framework, and then added dangling pieces of single-stranded DNA to glue nanoparticles in place. The method produced predictable clusters and arrays of nanoparticles, which could be very useful in the design of materials with custom nanostructures. Brookhaven physicist Oleg Gang said the structures “are somewhat analogous to molecules made of atoms”. “While atoms form molecules based on the nature of their chemical bonds, there has been no easy way to impose such a specific spatial binding scheme on nanoparticles,” he said. The engineers say they could be able to design different types of nanoparticles to take advantage of exciting atomic effects. Examples could include materials that regulate energy flow, rotate light, or deliver biomolecules. “We may be able to design materials that mimic nature's machinery to harvest solar energy, or manipulate light for telecommunications applications, or design novel catalysts for speeding up a variety of chemical reactions,” Gang said. This nanoscale construction approach takes advantage of two key characteristics of the DNA molecule: the twisted-ladder double helix shape, and the natural tendency of strands with complementary bases (the A, T, G, and C letters of the genetic code) to pair up in a predictable way. To do this, the team created bundles of six double-helix molecules. Four of these bundles were gathered together to make a stable, somewhat rigid building material - like combining fibrous strands to make a rope. These ropelike girders were used to form the frame of three-dimensional octahedrons, with researchers “stapling” the linear DNA chains together with hundreds of short complementary DNA strands. “We refer to these as DNA origami octahedrons,” Gang said. Each of the original six-helix bundles had one helix with an extra single-stranded piece of DNA sticking out from both ends. 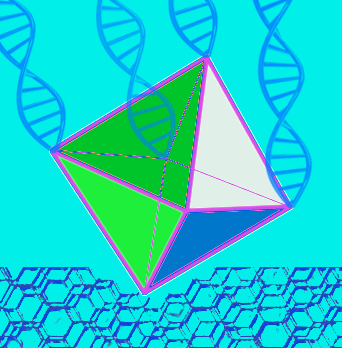 When assembled into the 3D octahedrons, each vertex of the frame had a few of these “sticky end” tethers available for “gluing” together with objects coated with complementary DNA strands. “When nanoparticles coated with single strand tethers are mixed with the DNA origami octahedrons, the 'free' pieces of DNA find one another so the bases can pair up according to the rules of the DNA complementarity code,” Gang said. The early tests showed that the method can be re-jigged to build larger arrays with custom applications. The scientists can change what binds to each vertex by changing the DNA sequences encoded on the tethers, and can change the sequence of some vertices to direct the assembly and arrangement of the particles in a very precise way. In one case they made two different arrangements of the same three pairs of particles of different sizes, producing products with different optical properties. They were even able to use DNA tethers on selected vertices to link octahedrons end to end, forming chains, and in 2D arrays, forming sheets. More details are available in the full report, published by the journal Nature Nanotechnology.